On 22 June 2006, I joined Green Fins dive operator South Siam Divers of Karon, Phuket for a day of Reef Watch coral reef monitoring at Racha Yai Island, south of Phuket. We were to be diving on the East Coast of Racha Yai, and would be sheltered from the West wind as we monitored two of the reefs on this side of the island. The journey from Phuket was not long and it has been several months since my last dive here. This time, I would be joining Khun Niphon Pongsuwan, coral reef biologist at the Phuket Marine Biological Center as well as being Green Fins Project Leader in Thailand, and Khun Keartiyot Phitakchart of South Siam Divers. We would be studying different techniques in estimating the percentage of live and dead coral on a dive. K. Niphon would be providing training in the Reef Watch monitoring method being used in the Green Fins Thailand project. The Reef Watch method allows visiting divers to take part in monitoring activities on any dive provided by a Green Fins dive operator. It is a quick and simple way of assessing the health of a coral reef and has been adapted from the original monitoring method developed by Dr. Elizabeth Woods. The focus of this day's diving was for K. Niphon to demonstrate methods of estimating the percentage cover of live and dead coral. It was a cloudy but clear day. My first impression on descending on the first dive at Staghorn Reef was that the water visibility was good, approximately 15m (50ft). We were over a Patch Reef (or Coral Gardens - areas of reef dotted on the sandy floor) with the main fringing reef in front of us to the South. 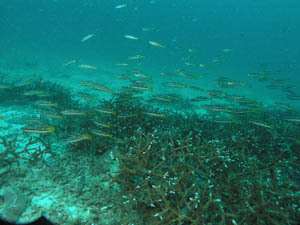 We were to swim South along the reef, following the shore line at a depth of approximately 10-12m (33-40ft). We set off at a slow pace but were stopped almost immediately by noticing a fishing net caught in the staghorn coral over an area of 2 square metres. We stopped to remove this net, taking care not to damage the delicate coral. This took us 20 minutes of dive time, including taking the net up to the boat before we continued on our dive.